Farberware Percolator Model # 208. Electrical Cord In Excellent Shape. Pyrex glass top. Needs to be shined up. Vintage Art Deco Chrome Continental Silver Company Inc. Coffee Percolator with bakelite handles is 115 volts and 400 watts. Is in good condition. Works and has power cord. Please ask any questions I try to respond within 24 hours. I have a 30 day return policy buyer pays return shipping. PayPal is the only form of payment I accept but I do make exceptions on occasion please ask . I work hard to keep 100% positive feedback, if there is a problem please contact me and we can discuss the issue. Thank you for your business. GLASS COFFEE POT PERCOLATOR WITH STEEL SHAFT - STOVE TOP - 8 CUP. Hope to deal with you again.”. While we try to describe any shortcomings,a picture is worth a thousand words. WHAT YOU SEE IS WHAT YOU GET: Our pictures show the actual products being sold. Rare Vintage Camfield Stainless Steel Coffee Percolator,8cup,works great,vg! 9 CUP SIZE - MADE FOR STOVE TOP. COMPLETE WITH FILTER & LID. (SEE PHOTOS) THE POT IS COMPLETE AND MISSING NO PIECES THE INNER WORKING ARE PRESENT AND IN GREAT CONDITION. Condition is Used. T h e r e a r e s o m e m a r k sand scratches o n outside from use and storage. Peculator is tested and in good working condition. All in excellent condition. The perculator is Corning 6 cup with Maxwell House coffee cup emblem. Two small carafes are Pyrex. The tray has a holder for candle to keep coffee warm. This is an estate sale find. In any event, both ends of the cord need to be desired to eliminate the frayed ends. The plug on the pot end got pretty hot during testing. It boils the water and percolates, but never shuts off like a normal percolator as it has no temp switch wired in. What You See is What You Will Get! I am Pretty Easy to Deal with but, it Depends on where the Item has to Go! s part of the. Vintage Mirro-Matic 30 cup Coffee Percolator #M-0130 Tested And Works! Vintage Mirro-Matic 30 cup Coffee Percolator #M-0130. Condition is Used. Shipped with USPS Priority Mail. The top of the basket is missing and there is staining. There are a few little dents and dings. I do not know what they have been exposed to or where they have been. Manning-Bowman & Co. Coffee Percolator. Stove Top Percolator. No electric base. Made in USA. In good used working condition. Needs cleaning. 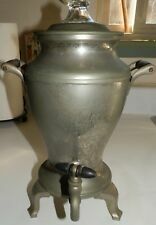 Hamilton Beach Coffee Percolator made in 1950's, has been tested and works great. Weighs around 6 lbs. The condition is excellent with no dents or dings, just a few minor surface marks. Red power indicator light does not work. Walnut wood handles Mid Century Atomic look. vintage 70s WEBALCO COFFEE PERCOLATOR -- Model 17238 -- USA --- Works Great! This item very likely shows wear, usage marks and may have scratches, etc. BEFORE ordering. There is no warranty on this product. Bright Floral retro design. Has been tested WORKS. This is a second beautiful piece of functional art, made in New Haven, CT, USA by Universal / Landers, Frary & Clark. Serve up an aromatic pot of coffee in style. This is a beautiful piece of functional art, made in New Haven, CT, USA by Universal / Landers, Frary & Clark. Serve up an aromatic pot of coffee in style. Vintage Manning Bowman Coffee Percolator, Chrome Finish with Wood Base & Handle 24 cup percolator Measures 10" Tall without lid and handle Circumference is 28" at widest point Condition: Functionality has not been tested but appearance is great with only minor signs of use. Minor scratches and markings from storage and transport. One very small, insignificant dent on the back side and two minor dents in the lid. Please see pictures showing item details and condition., . 30 Cup Capacity, Large. stainless Steel Exterior. HIGH:15-1/2" (Base to cover). Working Condition. The top section of the right handle has broken from the urn and is loose (photo 2). NO POWER CORD INCLUDED. Hamilton Beach coffee percolator. Model 21CM. Tested; works. Red light on front does NOT work. Signs of wear from use and storage. Dirty from use and storage; could use a more thorough cleaning. Item details: What you see, is what you get. This coffee pot is 7 1/2" tall without the hinged lid closed.